When there is a little time or if the preparation for the food might consume an ample amount of time, many people prefer to eat in a restaurant especially during family gatherings or even meeting with friends and colleagues. Restaurants in return must provide a good quality service to its customers. One of the things that a restaurant must be aware of is the menu for their food. Restaurant menus are important so one can easily pick a food from your restaurant without so much hassle. Menus also provides an overall view for the customer to check on what are the food that your restaurant can offer. An appealing yet simple and creative menu can help the restaurant even on their profitability. Creating a design for your restaurant or even cafe menu requires a little creativity and imagination. You and your team or crew might consider spending few hours to come up with a really exceptional menu that can not only outwit and outsmart your competitors but also enchant people to order and have a meal or snacks at your restaurant. At first, it might be a little challenging on what to include in your menu and how you can improve your menu and style it in a way that people’s eye can be hooked by its appearance. But of course, you must not deviate to your original purpose in creating the menu, which is to list down all the food that your restaurant is offering; thus, the integral part of the content is the food itself. Below are brief, concise, and helpful ideas on how to create a restaurant menu that may of help in case you want to quickly design your own menu. Know your customers. Understand the target market for your restaurant. With this, you can design your menu comprehensible enough for the readers. Take note that you have a wide variety of customers with a wide range of demographics. Young and old, husband and wife, elite and pro, top rank and rank and file, students, young professionals, and professionals, locals and foreigners, all are within your scope. 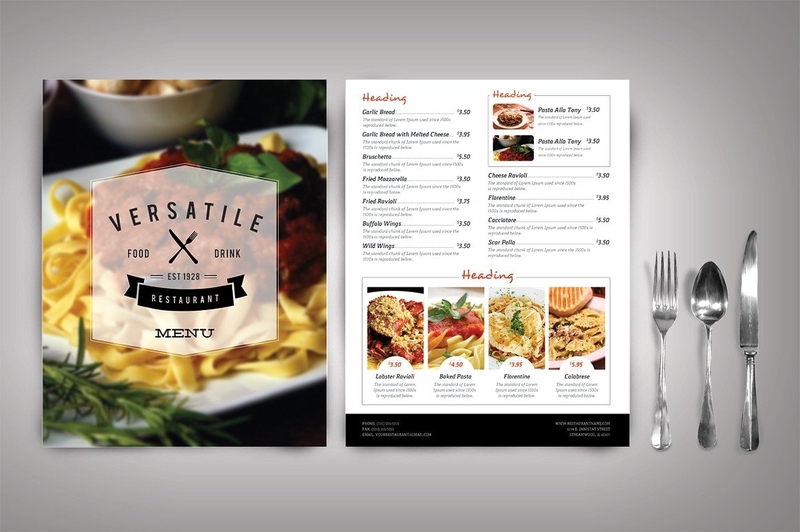 Even though these individuals might have different tastes, it is your menu design that will pull them to your restaurant. Have a good layout design. Decorate your menu as if you’re decorating your home during fiestas—appetizing, but still classy. More importantly, according to color theory, there are several colors that can trigger or induce excitement. These colors are red and yellow. You may consider including these colors to the design of your menu. Carefully list all the food that you can offer. A list must be designed in a way that customers will be curious about your food and what does it taste like. A well-taken photo of the food can be a very big help. In this part, the looks should exceed the taste. It may sound deceptive to customers, but it is not; it is just a marketing strategy to entice people to try out your food. Also, don’t forget to include the price for the food. That is one of the essential parts of the menu. Add freebies or promos. This is not really an integral part, but this can help a lot in attracting people. Usually, more customers would avail food if there are freebies even if the freebie is not that grand. Some would also be allured by the promos no matter how small they were. So take time to think of your own unique freebie to include in your menu. An example would be, free one liter of drinks of your choice if you purchase an amount of food greater than $20. Brainstorm, and surely you will come up with an idea of how you can promote your product through a freebie. While you have many competitors out there who are also trying to improve or still trying to make their own restaurant menu, you need not to worry if you only bear these things in mind and apply the necessary things to be placed in your menu to make it more presentable, alluring, and elegant.